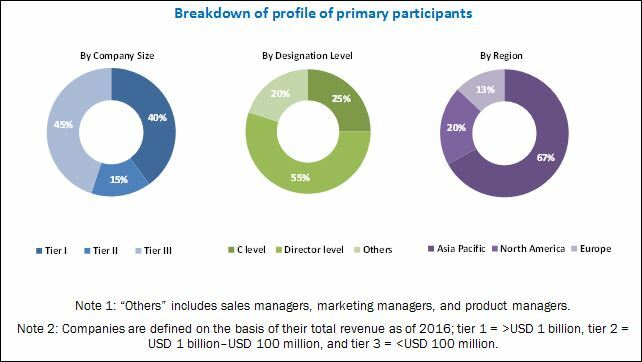 [171 Pages Report] The flexible electronics market was valued at USD 17.85 Billion in 2017 and is expected to be worth USD 40.37 Billion by 2023, at the CAGR of 11.0% between 2018 and 2023. The base year considered for the study is 2017, and the market size forecast is given for the period between 2018 and 2023. The prime objectives of this report can be summarized in the following points. This research study involves the extensive use of secondary sources, directories, and databases (such as Hoovers, Bloomberg Business, Factiva, and OneSource) to identify and collect information useful for this study. The research methodology followed in this report is explained below. After arriving at the overall market size, the total market has been split into several segments and subsegments, which is confirmed with the key industry experts. The figure below shows the breakdown of primaries on the basis of company type, designation, and region. The flexible electronics market includes players such as Samsung Group (Samsung Electronics and Samsung SDI) (South Korea); LG Group (LG Display and LG Chem) (South Korea); Solar Frontier (Japan); First Solar (US); Panasonic (Japan); Konica Minolta (Japan); OLEDWorks (US); Blue Spark Technologies (US); BrightVolt (US); Heliatek (Germany); Cymbet (US); Palo Alto Research Center (US); Thin Film Electronics (Norway); Royole Corporation (US); FlexEnable (UK); and Enfucell (Finland). The flexible electronics market is expected to grow from USD 23.92 Billion in 2018 to USD 40.37 Billion by 2023, at a CAGR of 11.0% between 2018 and 2023. The increasing adoption of displays, thin-film photovoltaics, and printed sensors have driven the market growth. Applications in IoT are also being targeted by flexible electronic devices, which would further push the market growth. The market is analyzed in terms of various application areas, and the demand for flexible electronics for various applications is mapped with the prominent verticals and geographic regions to obtain an overall picture of the flexible electronics market. The flexible electronics market in terms of applications is segmented into display, thin-film photovoltaics (PVs), battery, printed sensor, and OLED lighting. The market based on verticals has been segmented into consumer electronics; healthcare; energy & power; automotive; military, defense, and aerospace; industrial; and others that include building automation, smart packaging, environment monitoring, communication hospitality, sports, and research. 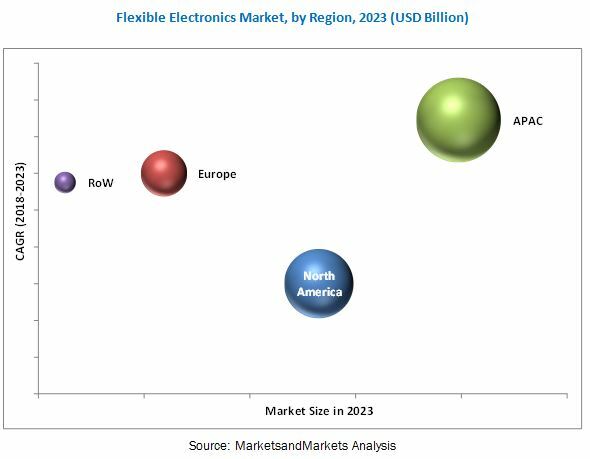 The geographical distribution of the flexible electronics market is categorized into North America, Europe, Asia Pacific (APAC), and Rest of the World (RoW). Displays LCD and OLED are expected to hold the largest share of the flexible electronics market during 2018–203. The market for displays is led by industry leaders such as Samsung and LG who produce flexible OLED display panels that are largely being deployed in smartphones, smart wearables, and televisions. Highest growth is expected from OLED lightings as they are expected to be increasingly deployed for automotive applications. The consumer electronics vertical is expected to hold the largest share of the market owing to the adoption of flexible displays in smartphones, wearables, and other devices. The automotive vertical is expected to demonstrate the highest growth during the forecast period due to the increased adoption of flexible displays, sensors, and OLED lighting panels. APAC dominated the flexible electronics market accounting for the largest share of the market in 2017. In addition, the region is likely to be the fastest-growing market for flexible electronics during the forecast period. APAC is the hub for manufacturers and customers of flexible OLED panels. In the market, Samsung and LG have been the leading companies that deploy flexible displays in smartphones and televisions. In APAC, flexible sensors are also increasingly being used for healthcare applications. APAC has witnessed an increase in the installation of thin-film PVs in the recent years, and their deployment is expected to increase steadily in China. With Japan and India being prominent countries in the adoption of thin-film PVs, other countries in the region are also shifting toward renewable energy resources. The widespread use of rigid electronic products for various applications hinders the market growth. The superior performance and better pricing structures of rigid components in applications such as displays, solar panels, batteries, and lighting solutions also restrain the flexible electronics market growth. Major players in the market include Samsung Group (Samsung Electronics and Samsung SDI) (South Korea); LG Group (LG Display and LG Chem) (South Korea); Solar Frontier (Japan); First Solar (US); Panasonic (Japan); Konica Minolta (Japan); OLEDWorks (US); Blue Spark Technologies (US); BrightVolt (US); Heliatek (Germany); Cymbet (US); Palo Alto Research Center (US); Thin Film Electronics (Norway); Royole Corporation (US); FlexEnable (UK); and Enfucell (Finland).